The Canada Revenue Agency (CRA) says its online systems have gone down, and it isn’t saying when they will be back. 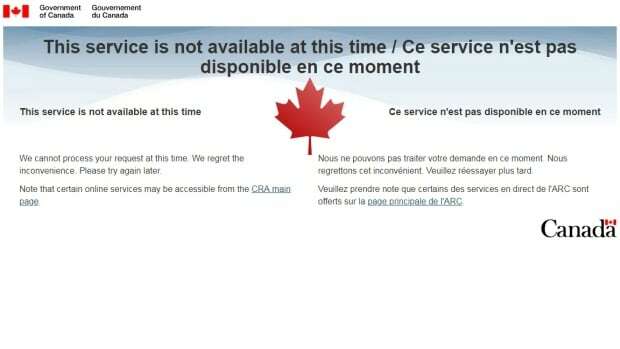 Some Twitter users said the CRA’s services appeared to have been down since Sunday night. Currently, both the “My Account” and “My Business Account” log-in pages come up with notices that they are unavailable. Other services, including changing personal info and NETFILE, the system where users can actually file their taxes online, are unavailable. “The service disruption is temporary,, and we are doing everything we can to fix it,” CRA spokesperson Dany Morin told CBC News. The CRA’s website is used heavily at this time of year for Canadians filing their taxes. The deadline to file personal income taxes owing is April 30.